The purpose of this study was to test the validity of the Head and Neck Patient Symptom Checklist (HNSC). 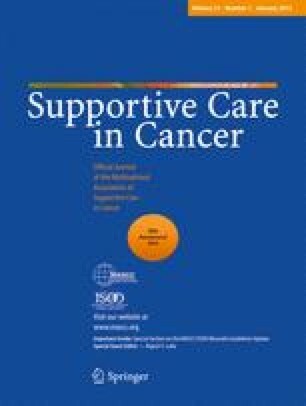 Three hundred and sixty-eight treatment-naive individuals with head and neck cancer prospectively completed the HNSC and the Patient-Generated Symptom Global Assessment (PG-SGA). The predictive validity was determined by comparing the HNSC symptoms interference scores to the PG-SGA scores. Multivariate logistic regression was used to determine the HNSC symptoms scores associated with reduced dietary intake, ≥5 % weight loss over 6 months, and reduced functional performance (FP). HNSC sensitivity (79–98 %), specificity (99–100 %), positive predictive value (92–100 %), and negative predictive value (94–100 %) were excellent, and the Cronbach's alpha coefficient was 0.92. The multivariate logistic regression showed that advanced tumor stage, pain, loss of appetite (LOA), and difficulty swallowing significantly predicted dietary intake. Advanced tumor stage, LOA, and difficulty swallowing were also significant predictors of ≥5 % weight loss over 6 months. LOA, difficulty swallowing, feeling full, and lack of energy were significant predictors of reduced FP. The HNSC appears to be a valid tool for determining symptoms interfering with dietary intake of head and neck cancer (HNC) patients. This instrument may aid in early identification of symptoms that place HNC patients at risk for reductions in dietary intake, weight, and functional performance. This research was supported by the South Lioness Club Scholarship in Nursing and the Queen Elizabeth II Scholarship awarded to the first author. We declare that we have no conflict of interest for this study.